onCourse provides an effortless way to manage your documents. Documents can be uploaded to onCourse and linked to Courses, Classes, Enrolments, Contacts, Tutors, Students, Sites and Rooms. Because all documents are version controlled you will never lose any historic information, making RTO compliance easy. You can add new documents directly in the edit view from many places in onCourse. 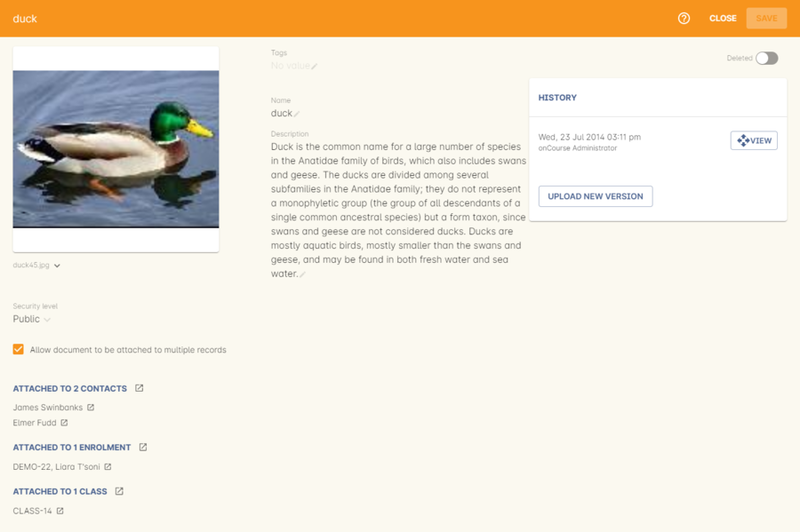 For example below you can see a Course "Accounting" to which we want to add a picture of a duck. To do this click the plus symbol above the attachments area. 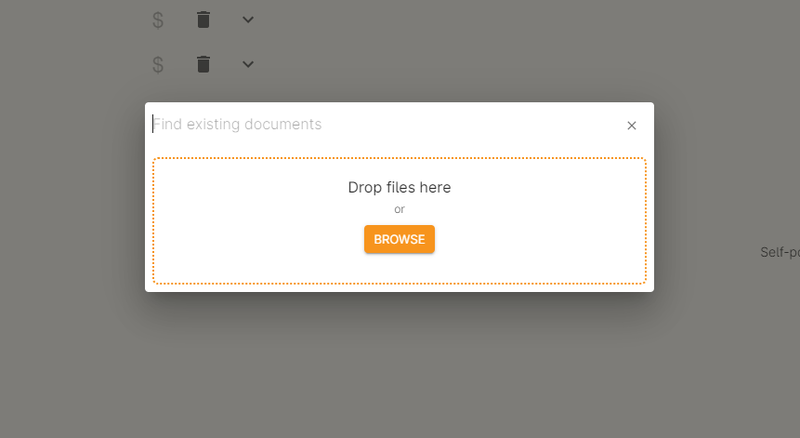 You will now be given a choice to find an existing document or upload a new file. Let's say we want to upload that duck picture from your computer. You can either click on the 'Select file...' button or drag-and-drop the file onto the box below that says 'Or drop here from desktop'. Once a file has been selected it will take you to another window that you can start entering additional information. Name - Allows you to change the name of the document. Access - This drop down box allows you to choose what access rights you want to give to the document. For more information please refer to the Access rights section of this chapter. Description - You have the ability to write a short description about this document. Adding a tag to this document can be done by clicking on the tag icon on the left side of the sheet. 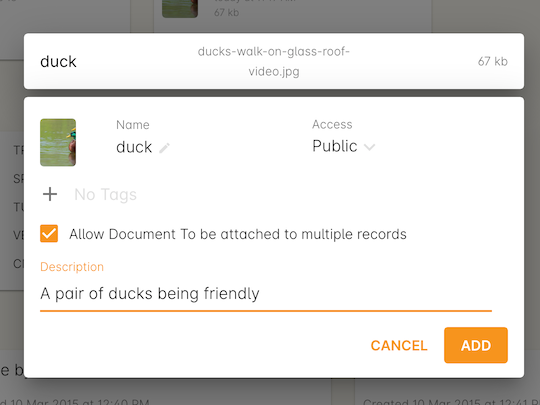 You can also choose whether duck is allowed to be attached to other records. If you select this option it will appear in the clairvoyance name lookup when you are trying to attach an existing document to another record. For attachments like contact profile pictures, you may choose not to allow them to be attached to other records. Below this there are radio buttons which let you state whether duck is attached to course ABC or whether it will get attached to all current/future classes for course ABC. You will only see this option if you are attaching a resource at the course level. Sometimes you'll have a resource which relates to course advertising, or a shared resource for all students and tutors in all classes from this course, like an assessment submission form. However, if you are attaching a resource like a new assessment task that is to be distributed to students enrolled in the class, and may change from class to class from the course, you can select the second option and attach it to the current and future classes from the course, without making it available to students previously enrolled in classes from this course. 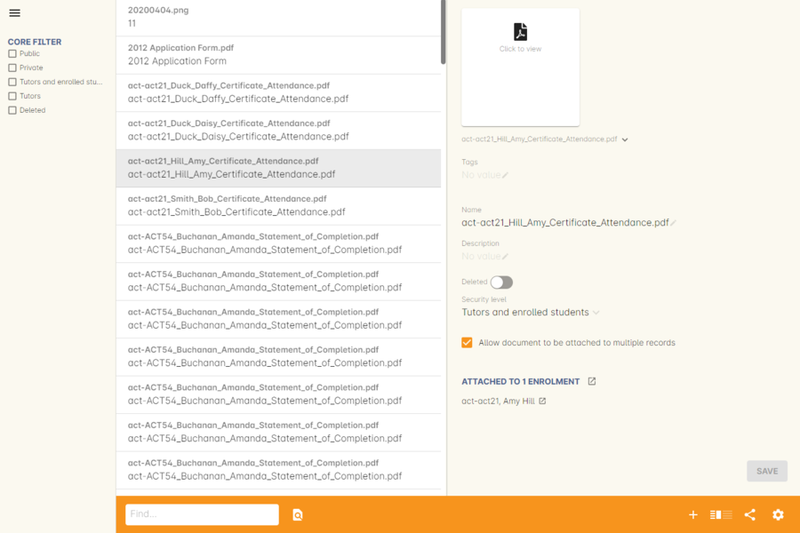 If you choose to attach the document to the class, but you began this process in the course record, when you complete and close the attachment sheets, you will not see the attachment listed in the course attachments as above. Instead, it will be visible in the class attachment lists where it has been applied. If you wish to attach an existing document (one which has previously been uploaded in onCourse) to a record, you will click + in the attachment list and the sheet below will open. To find an existing document, named duck, to course ABC you would start typing the name duck in the clairvoyance field on the left side of the sheet. A list will then appear with all existing documents in onCourse that contain the word duck in them. If there aren't any documents that are already stored in onCourse with the name duck, then no results will be returned. The name of the document, duck, will appear in the top left hand side of the page. To open the document or edit the information about the document, click the open related record icon next to the name. Below this there will be a short desciption about the document (if added). You will see any tags attached to this document. 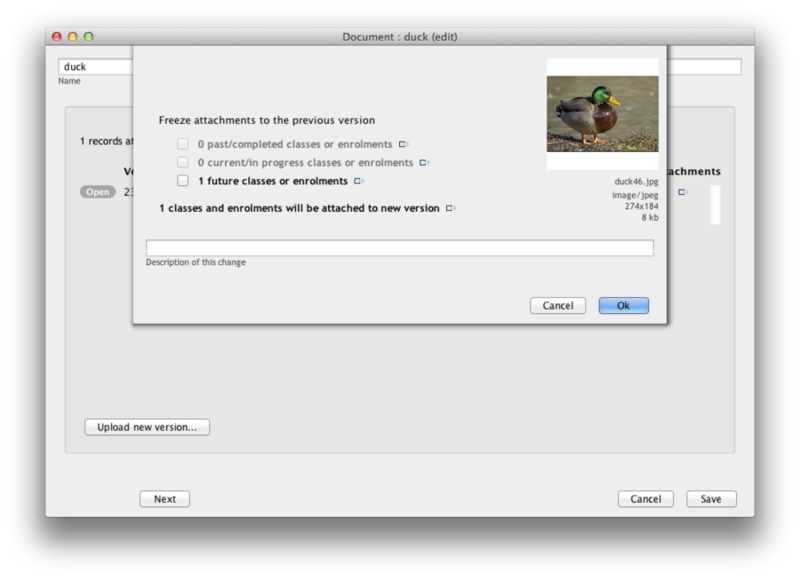 The checkbox below this allows you to freeze course ABC to a specific version of duck. If you check this box then the buttons below named 'frozen' will appear, allowing you to select the version. More information on freezing can be found in the freezing section of this chapter. Below the heading 'VERSIONS' will list all the previous versions of this document along with when they were created, by whom and if they're frozen to this record. You also have the ability to open any of these previous versions of the document by clicking the on the 'open' button. If the checkbox 'Freeze this course to a specific version' is checked you can change which of the previous versions of the documents you want to freeze this course to by simply click on the 'frozen' button next to the user name. The image of the latest version of the document will appear on the top right hand side of the page (this can be useful to make sure you have chosen the correct document in the case of an image type document). Below this will be the name, format and size of the file. The access rights of the document will also be displayed on the right sided of the page, in this case the document has been give public access, for more information on this please refer to the Access rights section of this chapter. Once documents have been stored in onCourse you can edit their properties in the Document list view. The list view shows you a summary of the document, including the information icon (black speech bubble with a white i), the document type icon, the document name, the Web viability (i.e. Access) and the document size. To view the document by double clicking on the row. You can view or edit a document's settings by double clicking on information icon. You also have the ability to add tags and view the 1 record that is linked to duck by clicking on the open related record icon next to the text 'Currently attached to 12 records'. The check box below lets you know whether this document has been allowed to be able to be attached to multiple records. This option can't be changed when editing an existing document if it is already attached to more than one record. By clicking on the 'History' tab you have the ability to view previous versions of the document 'duck' and view either the records linked to them or open a previous version of duck. 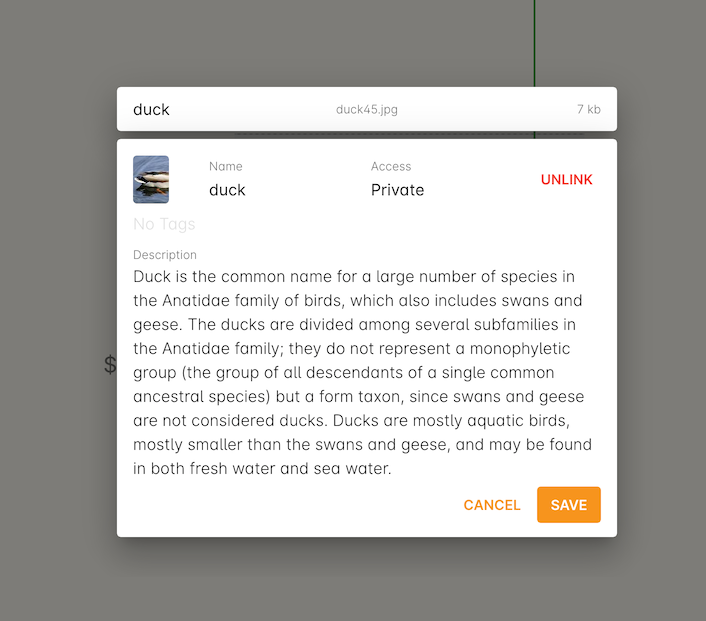 You also have the ability to upload a new version of duck by clicking on the 'Upload new version' button at the bottom left side of the sheet. More information on this can be found on this in the next section Versioning. onCourse keeps a history of all files you upload, allowing you to link records to specific older versions and review the history of your documents at any time. This makes it easy for you to comply with ASQA auditing requirements as well as ensuring you never lose an important document again. Freeze this attachment to the previous version to x number past/completed classes or enrolments - This means that there are x number past/completed classes or enrolments that have been linked to the previous version of duck. 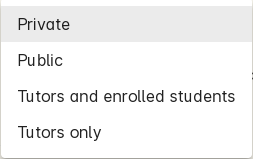 If you check this box then the previous version of duck will be frozen to the x number past/completed classes or enrolments. In the case of uploading a new version of an assessment task, for example, you would freeze the past/completed records to the version that applied to them. Freeze this attachment to the previous version to x number current/in progress classes or enrolments - This means that there are x number current/in progress that have been linked to the previous version of duck. If you check this box then the previous version of duck will be frozen to the x number current/in progress classes or enrolments. Depending on the change made between versions, you may sometimes choose to update the current records, and sometimes not. Freeze this attachment to the previous version to x number future classes or enrolments - This means that there is x number future class or enrolment that have been linked to the previous version of duck. If you check this box then the previous version of duck will be frozen to that x number future class or enrolment. Below this will be the total number of classes and enrolments that will be attached to the new version of duck. Description of this change - you can write a short description explaining the reason or differences of this change. When uploading a new version of a document it is good practice to make a short note describing the change between the previous version and this version. This 'description of change' is available in the document history version list. Once you have finished with the above information you can save the changes made by clicking the 'Ok' button at the bottom right hand side of the page. The term freeze and frozen is used in this chapter to describe when either records have been attached to a specific version of a document or when a specific document has been attached to past/completed, current/in progress, or future classes or enrolments. 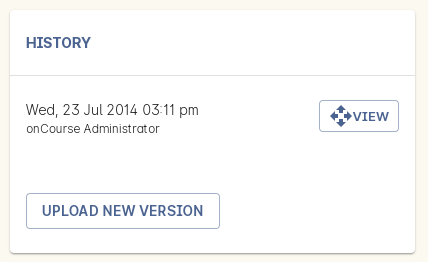 When a record is frozen to a specific version of a document it means that even if you update the document the record will still have the previous frozen version of the document attached to it, and won't receive the update. When you upload a new version of a document to certain record types you will have the choice to freeze the previous version to past/completed, current/in progress, and future classes or enrolments. Some parts of onCourse have special handling of documents. At the moment the only publicly visible example of this is the contact picture. If you open a contact record (company, tutor, student) in edit view double click on the image at the top left, you can add your own photo of that person. A file dialog will appear and you will be able to choose a photo to add. It will be automatically resized to a thumbnail size before being stored. Public - This gives everyone access to the document and will appear on your onCourse public website, as part of the sales and marketing material. When you open this document from inside onCourse, you can send the URL link for these documents to other users and they will open the attachment in a browser. Private - This means this document will not replicate to the website or the skillsOnCourse portal. It will only be available to administrative users of the onCourse software. While a private document will open in a broswer should you click on the link inside onCourse, this URL contains an access key ID and an expiry period. Should you send this URL to another person, they will receive an 'access denied' message if they try to open it. A private document can only be viewed via the link to it inside the onCourse application. Tutors and enrolled students - Both Tutors and enrolled students of the related course or class can view this document in their skillsOnCourse portals. Tutors only - This means only the tutors of the related course or class can view this document in their skillsOnCourse portal. Both 'tutor only' and 'tutor and enrolled student' documents opened from inside the onCourse application will load into a broswer with URL containing an access key ID and an expiry period. Should you send this URL to another person, they will receive an 'access denied' message if they try to open it. You can send the class tutor or an enrolled student a link to the document inside the portal to allow them to access it e.g. https://www.skillsoncourse.com.au/portal/resources to access all their resources, or https://www.skillsoncourse.com.au/portal/class/5040367 to access the resources attached to a specific class, where 5040367 is the class id in the onCourse web database.